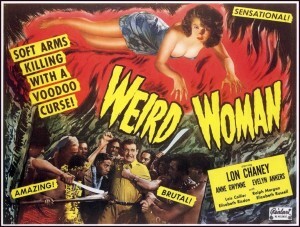 Weird Woman (1944) is a fairly lose adaptation of Conjure Wife, starring Lon Chaney Jnr. Running at only an hour, the film rattles along, and performances are generally good, that said, I am not Sure Lon Chaney Jnr. convinces as a professors, but Anne Gwynne and Evelyn Ankers are very watchable. The budget was clearly not huge, but the atmosphere around the campus is well captured, even if it never quite goes anywhere. Worth watching? I would say yes. Watch the trailer…. 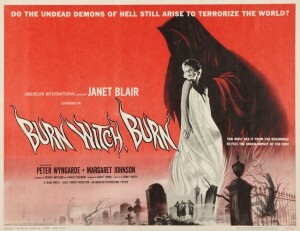 Night of the Eagle (Burn Witch Burn )(1944) is a highly effective film, with a great performance by Peter Wyngarde, The script is by Richard Matheson & Charles Beaumont) is intelligent and whilst it narrows much of the narrative from Fritz Leiber’s novel but keeps the tone of both the supernatural and the paranoia from the novel. Sidney Hayers, the director, who’s only other notable credit would be The Avengers (indeed Albert Fennell is one of the producers), did a great job directing this film. A bigger suprise is Peter Wyngarde. Primarily known to audiences now as the flamboyant Jason King, Wyngarde gives a powerful performance as Norman dealing with his initial skepticism, then increasing fear. A minor classic! Witches’ Brew (1980) I cannot claim to know much about this other than it was an uncredited comedy adaptation of Conjure Wife., and it starred Terri Garr. It seems to have sunk without a trace! The Girl with the Hungry Eyes (1995) A very low budget, very loose adaptation of Fritz’s short story. Moment of Fear – Conjure Wife (1960) I have not seen this adaptation, and there is scant information on it, if anyone has seen it, give me a shout! Fritz was served well by Night Gallery. Both the adaptations are good, with the Dead Man probably the more memorable of the two. Hulu has the episodes on for free, which makes them well worth a watch. Fritz was also recorded reading Gonna Roll the Bones and In The Witches Tent for an Alternate Worlds recording LP.